The confirmation is only preliminary at this point, but I am preparing to teach a GIS Librarianship course next summer (2008) for the University of Arizona's School of Information Resources and Library Science. This course will be 100% distance education, so I encourage any library student or librarian out there with an interest in GIS to consider enrolling. I will post more details here as the confirmation becomes more official and as the date gets closer. What is GIS and what contributions can a library provide to this subject area? This will be a nice, but brief overview of GIS and GIS librarianship. The final section (below) will consider the role of GIS librarianship in greater detail, but this will serve as a nice introduction. My thoughts are this will take up the first half the course, and will be a condensed version of an Intro to GIS course, with a focus on data types, data acquisition, and data preparation. In essence, the pre-analysis concerns of GIS. This will focus on metadata and the use of various types of metadata catalogs. This will focus on selecting and processing datasets from data vendors, public data archives, and government organizations. I think it best to end the course with this topic. At this point everyone will have a deeper understanding of the potential and can actually contribute to the conversation. This might even make a great final project. I am sure I am missing something(s) here, but I feel pretty good about getting at least this much down. Of course, if anyone has any comments, suggestions, or criticisms (keep those clean, yeah?) feel free to leave them as comments here or email me at: been [[-at-]] uta [[-dot-]] edu. GIS projects must be due soon in many of our classes as folks from all over campus are coming into the GIS Lab for assistance with projecting their data. Funny how everyone from different departments and different classes are all focused on the same thing. Wonder if this has any relationship to how women's menstrual cycles sync after living close together? Does this mean the various departments are psychically, biologically, or spiritually moving in unison? Ha! Anyway, by far the most popular question in the lab recently has been confusion about defining and projecting data. Map of Texas showing up in the Pacific? Saw this a few times in the lab yesterday. Always the same cause. An undefined shapefile, most of the time geographically referenced, was projected to some form of Lambert Conformal Conic without defining the projection first!! ArcMap can not transform a projection without defining the initial projection first. Students from many disciplines are having a tough time understanding when and why it is necessary to define their projection before re-projecting their data. As stated in the ArcGIS 9.2 Help, the projection definition "records the coordinate system information for the specified input dataset or feature class including any associated projection parameters, datum and spheroid. It creates or modifies the feature class's projection parameters." So, how can you know when your data's projection needs to be defined? Well, first clue is ArcMap will give you a popup letting you know. These are not ads. Read them. Second clue is that your data will not be in the correct position, such as a map of Texas in the middle of the Pacific. However, if all of your data is consistently un-defined, then you will only notice this if you add another layer that is properly defined. Tough part is that if a student adds 10 layers whose projections are undefined, and then adds another layer that is properly defined, it might seem as if the defined layer is the one in the incorrect position. Like a democratic vote, un-defined wins 10 to 1. Why is this confusion happening more than it used to? My opinion is the loss of ArcMap's assumed geographic projection definition. ArcMap 9.1 (and previous versions) would detect and assume that un-defined shapefiles were geographically referenced (decimal degrees). If the data is indeed geographically referenced, then ArcMap's assumption removes the need to define the file before projecting it. However, 9.2 makes no such assumptions. Undefined data must be defined, whether it is geographically referenced or not. Which is better? I sure do not know, but I do know that this is forcing our students (and faculty) to give a lot more thought to projections and datums than they needed to in the past. First GIS Workshop - Standing Room Only! Yesterday's workshop was a success on every conceivable level. We had 30 participants, which in a 27 PC lab is the best. Breakdown was 4 faculty, 12 grads, 8 undergrads, 2 staff, and 4 non-affiliates (City of Arlington intern, couple of investors, and an alumnus). By the 5 minute mark every seat was taken and a noticeable number of people dropped by and left when they saw how crowded it was. Everyone seemed very engaged. Lots of discussions amongst everyone, and the topics invariably lead to how the techniques and/or data sources we used can be incorporated into their own research. Almost everyone was able to complete the entire workshop, which culminated in the creation of a Google Map highlighting their results. These Google Maps were generated using our ArcMap2GMap script. The university Public Affairs Office sent out a nice press release, that was mentioned in the Ft. Worth Star Telegram. The Shorthorn (university newspaper) printed a fantastic story this morning that featured a number of nice interviews with students. Let's hope this excitement bleeds over into our next workshop on air pollution in the metroplex, scheduled for October 25. Details here. Last week, I posted the basic details about this semester's 3 workshops. Well, after a round of late night shifts, the new hotel workshop is just about ready to go. No doubt about it, there is so much data included in this workshop. Everyone will see that I got carried away... Here are highlights of the details of the data sources used. Complete details in the handout. All library GIS workshops are designed to educate, intrigue, and entertain both GIS users and those merely interested. This portion, while slightly slow for the GIS users, makes those new to GIS comfortable with the software. This will allow us calculate ratios such as receipts per sq f, and to calculate the total sq ft of hotel space. What did I not have enough time to incorporate? While we do have the zoning and landuse data in the database, it is not incorporated in the site selection process...mainly due to lack of time. It can, of course, be referenced at any time by adding it as a layer. Attended a demonstration of the new Texas River Information Management System (TRIMS) in early September at the Ellison Miles Geotechnology Institute (located in Farmers Branch, TX on the Brookhaven College campus). TRIMS went live in late August. This ArcGIS Server driven web mapping application is a fantastic resource for us here in the Trinity River Basin (North-Central, Central, and into Eastern Texas). Here is a list of the layers included. We discussed two primary uses for the interactive website. First, as a tool for landowners to manage natural resources. Second, as an educational tool to be used in the K-12 and college classroom. There is no doubt that the ease of use and thorough content in TRIMS will serve both of these purposes. I shared this resource with our science & engineering librarians, and we have been pushing this resource to our non-GIS savvy students. As all of the data is derived from public resources, we have access to all of the information available through TRIMS in GIS format, or in formats that can be incorporated into a GIS. We are planning a workshop next Spring semester targeting our education faculty and students, and this is one of the key resources I plan on showcasing to them. One fantastic feature I want to point out is the live steam gauge data. Using the site ID number, clicking on any gauge will create a link directly to the USGS real time water data. For example the map on the left, the gauge at the Clear Fork of the Trinity River in Fort Worth links out to the following real-time water data. This is a great example of what is most great about this site. The way it brings together numerous public data sources into one user-friendly interface. Yes, as the Map Explorer points out, some folks will complain that it is not as easy to use as Google mapping products, but this is because of the 30 spatial layers and the great markup ability included in ArcGIS Server. This is a great resource that I look forward to promoting as often as I can. As part of Governor Perry’s Trinity River Basin Environmental Restoration Initiative, the Trinity River Authority’s Clean River Program in cooperation with TCEQ has funded the Trinity River Information Management System (TRIMS) through Texas A&M University’s Institute of Renewable Natural Resources. I am teaching the spatial analysis course this semester, and the first two projects everyone is working on is based on a suitability site selection exercise. First, they need to identify the best locations for the development of a new Coast Guard facility on the Gulf Coast. Second, they need to develop an ArcMap Model to automate this suitability process. The U.S. Coast Guard is concerned about the possible damage to the environment and natural habitat along the Texas Gulf Coast if an offshore oil spill were to occur. The Coast Guard has obtained funds to build a new facility whose primary purpose is to protect the environment. They are required to use at least one Census 2000 attribute by tract, and whichever data sources they deem necessary from the Texas General Land Office. There are some great Gulf Coast environmental and habitat resources at the GLO, including the Environmental Sensitivity Index Shoreline, In-Situ Burn Exclusion Areas, Offshore Oil/Gas Platforms, Priority Protected Habitat Areas, Wildlife Refuges, and much more. For our educational purposes, it is nice that some of the GLO's files, such as the TXDOT Roads/Highways, are undefined shapefiles to give everyone the challenge of defining it. After the initial suitability site selection project, everyone will create an automated Model using ArcMap's ModelBuilder. Standard suitability analysis such as this is so straight forward that it works well in Models. However, I found a bug in the latest ArcGIS 9.2 SP3 service pack. Seems as if the Classify button is grayed out when the Reclassify tool is incorporated into a Model. Of course this only occurs when the reclassification scheme is a parameter. I never saw this before and can only assume this is the result of this latest service pack, which was released in August. Searched the user forums, but surprisingly could not find anyone else who come across this problem. I found a work-around, however, which has thus far worked well enough for me not to really complain about this. Found that if you also add the reclassification field as a parameter, then the Classify button become activated. Seems as if the Model is not accepting the reclassification field as specified by the developer, and is requiring the user to specify the reclass field. Good enough. Perhaps this is a new safeguard feature and not a bug. With that said, their presentations for their initial possible site selections are next week. We've got some great students this semester and I am really looking forward to seeing what they came up with. Our data users are so loving these new online data subscription options available through products such as the Geolytics On-Line Data & Maps and Simply Map. They can hop online, on or off campus, and access the data they need. These products make accessing demographic and business data as accessible as finding journal articles. I had two faculty this past week alone make an effort to let me know how pleased they are that they and their students can access such data so easily online. Previously, we purchased such datasets via CD or downloadable files. Geolytics products were traditionally distributed as CDs to install on stand-alone PCs. Acquisition departments do not enjoy purchasing electronic monographs such as these, and then users needed to come into the library to access this data when the majority of our electronic holdings are accessible from off-campus. We have also been purchasing Applied Geographic Solutions (AGS) marketing data on the block group level from Spatial Insights, but this data was also distributed on CD for a single user. We worked out a solution where we received permission from Geolytics and AGS to serve the CD data using Citrix (and we continue to do so), but this requires the client to install an application. While the installation is small and free, it imposes numerous barriers that are not present for the majority of the library's other databases. Also, students do not normally have permissions to install software in campus labs. Now, not only can users access their data so easily via the web, but they have choices to generate and download customized maps, delimited files, and even shapefiles containing their selected attributes. Geolytics CDs have always had this ability, but as of this summer, Simply Map now also provides the ability to generate and download shapefiles. Seems like every month or so, Geolytics sends an email about another title they now provide via the web, and I discussed over the summer with the folks over at Geographic Research, Inc. about plans they have to build addons to their base Simply Map package. I hope they compete viciously with each other. That's the best! By the way, I am sitting all alone here by myself during my first couple hours providing GIS Research Assistance in SL. Sure, it gives me a chance to write up this post, but someone come over and chat a bit, yeah? Well folks, our library is making the move and has decided to test the possibility of providing research assistance in Second Life (SL). The pilot project will focus exclusively on GIS research assistance, after which we will examine its outcomes and decide how to proceed. So, starting with the public opening of the new Info International Island tomorrow (Friday, 09/21), anyone needing GIS research assistance can receive live assistance help from Mapz Oh during the times listed below. The hours listed here are in SLT (Second Life Time), which is the same as PST. 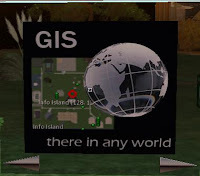 We also created a new SL group, entitled GIS Researchers. 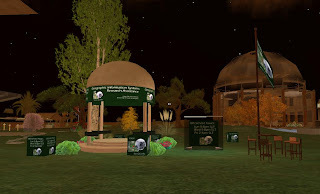 The purpose of this group is to (1) provide an in-world network of enthusiasts and experts who can provide research assistance, and (2) to announce any GIS research activities in SL, such as presentations, showcases, discussions, etc. Bear in mind, however, that things move and evolve so fast in SL that the purpose, direction, and goals we initially have for this new project may change as we see what needs (if any) arise. For this SL venture of GIS Research Assistance, we envision providing assistance with RL geographic information systems research. GIS Research - Why Offer GIS Assistance via SL? Three reasons. First, it is my belief that virtual reality will play a major, possibly a dominant, role in the future. As information professionals (librarians), it is our responsibility to learn to interact with and to master these tools. Second, at this point we do not know how many of our students use Second Life. If any GIS users do use Second Life, they will surely use this service and then we can actually know and count the number of users. Third, why not? It is so easy to provide this additional service that we have nothing to lose and everything to gain. Thanks so, so much to the great librarians at Info International, especially Abbey Zenith, for allowing us to set this up on their space. A great big thanks also to Razitra Artizar for SL enthusiasm and guidance. You guys are the best. As we did last year with Mapping the Afghan Population in the US ( see background), the Information Literacy Librarian and I teamed up to create a project that will integrate numeric and spatial resources into the freshman English Composition courses. All sections of Freshman Composition I (app. 60) are reading Maus: A Survivor's Tale, by Art Spiegelman. As of this moment, 17 sections have signed up to bring their class in to use the interactive map we designed. This is a whole lot of students who will get exposed to detailed aspects of GIS and geography. I love it. The lesson, from which we hope to publish results, is measuring the ability of interactive GIS and multimedia to enhance students' ability to select a research topic/question. The students first read a bio from Holocaust survivor Madeline Deutsch and write a research topic. Then, we add two additional immersive layers of information. First we play a brief multimedia clip of Madeline describing her ordeal and its aftermath. Second, we lead them through an exercise where they explore Madeline's life before, during, and after the war using the interactive map we created. We met with the first two classes this morning and our impression is that it was very successful. The instructor agreed and seemed very enthusiastic, which is always a good thing. Of course. I am currently working with numerous faculty on campus who teach or whose research interests include WW II or the Holocaust. However, it was the certainty of exposing so many freshman to these types of resources that made this project one of our highest priorities last summer. Perhaps researchers and/or educators outside of our fair university may have a use as well. Jewish population figures were gathered from the American Jewish Society Yearbook. Big thanks to Texas Christian University Library for loaning them to us. The map features were gathered from historical maps available from the U.S. Holocaust Museum. Historical world shapefiles provided by ThinkQuest.org. Starting last semester, we began co-presenting the workshops with faculty whose research expertise was in the subject area, but not necessarily using GIS. This turned out to be very successful and we are repeating that this semester. Description: Learn how Geographic Information Systems (GIS) can be used to analyze the number of hotels, rooms, and occupancy rates in Arlington. We will then identify the best location for the construction of a new hotel to help handle the influx of football fans. Data sources include hotel data from the Texas Comptroller of Public Accounts and commercial property data from the Tarrant Appraisal District. Description: Learn how Geographic Information Systems (GIS) can be used to statistically estimate pollution levels within the DFW metroplex and to then identify the street segments that traverse through the regions with the highest levels. Data sources include pollution measurements from the Texas Commission on Environmental Quality, the Environmental Protection Agency, and various datasets from the North Central Texas Council of Governments. 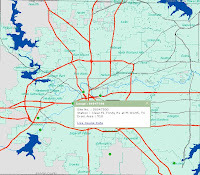 Description: Learn how Geographic Information Systems (GIS) can be used to analyze the residential property market in Tarrant County to identify ideal investment houses to flip. Data sources include sample Multiple Listing Service (MLS) data from the North Texas Real Estate Information Systems (NTREIS) and foreclosure listings from the Department of Housing and Urban Development (HUD).